Documenting a building model can be extremely time-consuming. Sometimes, a single project can produce hundreds of drawings and documents. 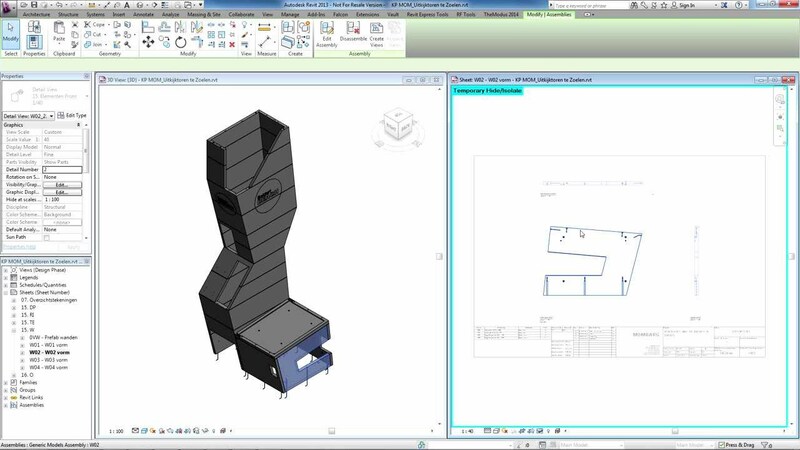 This often means creating multiple views and sheets in Revit. In addition to being time-consuming for modellers, the drawings often deviate from each other in practice. Our unique TheModus Documentation add-in for Revit will help you create quick views and sheets for an entire project or a single component. You can generate simple work drawings, presentation drawings, maps, installation plans, and tender drawings in just a few clicks. This means you can add everything you need to a drawing in no time with the right layout and conform with your company standard. Generate presentation, construction, installation, and production drawings in a flash, according to your company's standards. Producing drawings based on your design is no longer a time-consuming chore. Generate flawless views and sheets. Refocus and invest your time into your design. The work drawings and all associated views, detailed reports, and lists of quantities are immediately accessible in the production environment. This allows for quick and error-free control at the construction site. In terms of time savings, our clients earn back their investment after just one project! As a BIM manager, you want drawings to reflect the company standard. To ensure this, you can define these standards in a comprehensive plan. All modellers generate step-by-step views and sheets that meet your requirements. With TheModus Documentation, you can automatically generate floor plans, views and 3D views of your project or project component. In addition, TheModus Documentation gives you the possibility to define standards in order to generate the same consistant standards from your team members. The Revit add-in is available for all Revit users, from architects, contractors, and structural engineers to installation technicians, constultants and suppliers. Would you like personal advice or further information about TheModus Documentation?